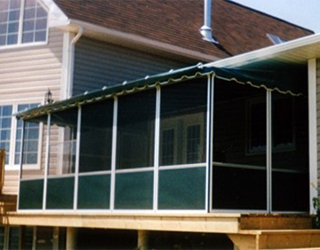 Key Differences Custom Sizes - Permanent Screened Enclosure. All Weather, Permanent 3-Season Sunroom, Thick Vinyl Top (22 oz.) Elegant and Sturdy. Very impressive quality and appearance. Spring & Summer use, High Quality (14 oz.) Heat Sealed Vinyl Top. All parts Are aluminum with stainless steel bolts. No Rusting. 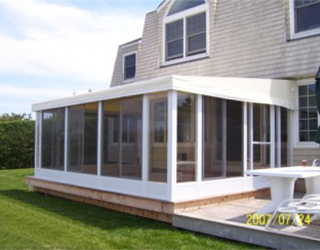 Key Advantage Permanent Installation Permanent Sunroom at a lower price Moderately Priced for exceptional Quality with most features of any room. General Construction 2"x2" & 1"x2" Extruded Aluminum framing. All 'U' channels extruded aluminum, Fiberglass screens. Kick plate is an available option 1/8” Thick Extruded Aluminum Load Bearing Framing. Fiberglass screens, Kick plate, Sliding Polymer interior windows included. Patented roof tensioning system. 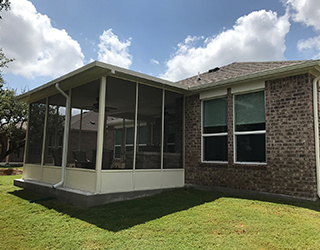 Excellent Roof Overhang and water drainage 44” wide x 74” high Aluminum Screen Frames, joined with Vinyl Hinge, Fiberglass Screens. Interior wind & privacy panels available. Easy roof tensioning system, built into a 5" roof overhang so that the rain water does not wash down the front screens. Standard Walls consist of: Horizontal extrusions are 1" x 2"
Vertical extrusions are 2" x 2"
You can place the support bar, which is on the inside of the screen panels, anywhere within the range of center height to 1/3 height. This means that you can create a clear line of sight for when you are seated in the room. Optional doors in almost any position Single Aluminum Sliding door may be positioned to suit your deck. Additional Sliding doors available. All sliding doors on rollers for easy use. Rafters are 1” round galvalume tubing. Top wraps around tubing for appearance and to prevent flapping in higher winds. Vinyl: Full privacy, White for maximum brightness or a color to match the top.